This is the perfect way to say “Thank You” to that special client with a presentation of a Gift Certificate for a hot air balloon ride. Encourage you employees to rise above the rest or set the sky as the limit for employee performance. The possibility of a magical hot air balloon flight will get their attention and it will make this unique incentive work for your company. 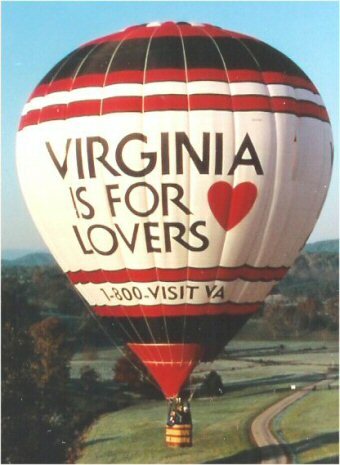 From 1998 to 2001, the staff of Balloons Over Virginia, Inc. professionally represented the Commonwealth of Virginia by flying the “VIRGINIA IS FOR LOVERS’’ hot air balloon throughout the continental United States and Canada. Throughout our history, Balloons Over Virginia, Inc. has provided and managed numerous local, regional and national corporate advertising programs featuring full artwork balloons and/or banner presentations. Our clients include The Virginia Tourism Corporation, The Virginia Lottery, The Chrysler Corporation, Eastman Kodak, Reach Magazine, BB&T Bank, The National Firefighters Association and GTE Wireless / Verizon. Start-up and operational costs are quoted on request. Banner and operational costs are quoted on request. Banner sizes available up to 20' X 50'. 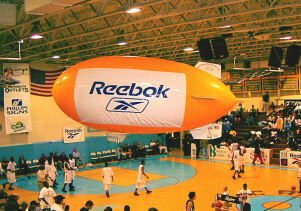 This thirteen foot long, helium filled blimp puts your company’s name on a three by seven feet banner as it flies over the crowd at almost any indoor event. Please call for pricing. Our balloon-port is available for rent as an added option to your balloon flight. Facilities include a gas grill, refrigerator, coolers, microwave, bathroom and a collection of memorabilia from sixteen years of ballooning. Please call for price and availability.